This North American style, ADA Compliant, multipurpose push button switch covers a wide range of applications both indoors and outdoors. It incorporates a unique, patented design that helps dramatically to stop accidental activation. You have the choice of wording and language. Interchangeable or replaceable N.O. 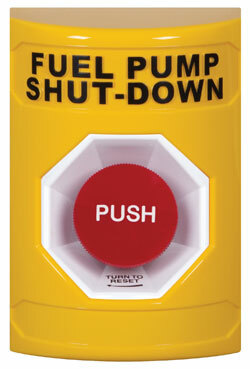 or N.C., SPST gold-plated contact blocks rated for 6 amps @ 600 VAC or 1 amp @ 250 VDC..